How is the current IT freelance market in Germany? Our colleagues at freelancermap.de asked over 1.000 IT freelancers in Germany, Austria and Switzerland about their rates, income, client relationship and more. We've compiled the most interesting insights! This is probably one of the questions that interests us more: How much are freelancers charging? We want answers. On one side, freelancers want it for pure gossips' sake. On the other, it helps freelancers understand if they are charging their clients correctly, so they don’t overcharge or undersell themselves. The IT market study shows that freelance rates continue growing. 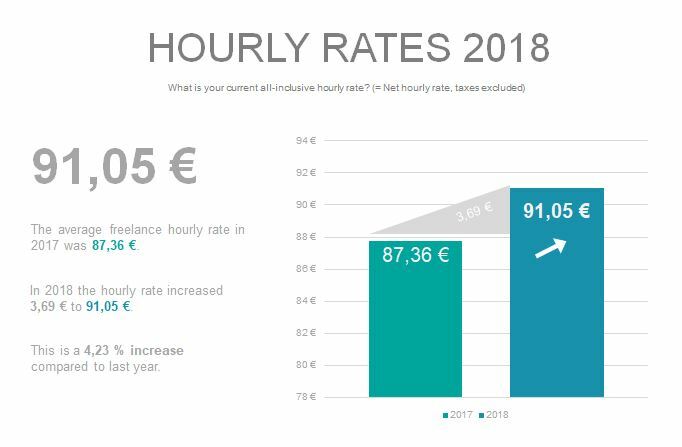 The hourly rate amongst IT freelancers increased 4,23% up to an average hourly rate of € 91,05/hr. The report showed that freelancers working in SAP are currently earning the most with an average hourly rate of €110,19. Freelancers working as consultants take second place with an average hourly rate of €104,94. Still on the podium and occupying 3rd place are freelancers working in the IT infrastructure field: IT architects, DBA, data security experts, etc. Their average hourly rate is €88,24. Generally, freelancers are satisfied with their income (71,61%), especially SAP freelancers (83,13%). According to the study, the proportion of women among IT freelancers in Germany remains low at just 11,54%. In terms of earnings, the gender pay gap is also noticeable. Women are getting almost 7 euro less than men per hour. The gap increased in comparison with 2017, when the difference was “just” 3 euros. Regardless of the difference, 62,70% of women said they were satisfied with their income as freelancers. 62,64% of all surveyed freelancers agreed that finding new clients is the most challenging part of being a freelancer. This has been the biggest struggle in previous studies as well and continues to be on top. The freelance market is growing yearly and that means also the competition is more fierce, so finding new clients might still be the biggest challenge in the following years. Freelancers also mentioned that having a fluctuating income was the biggest disadvantage of being a freelancer (47,62%). 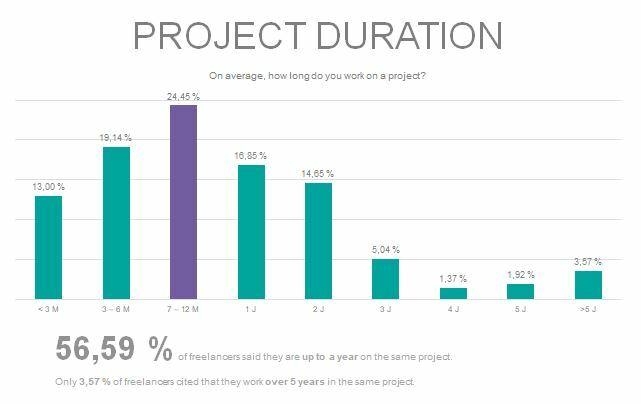 56,59% of all surveyed freelancers said they are generally in a project up to a year. The market study also showed that within the IT field the most common contracts run between 7 months and a year (24,45%). Generally, these are complex projects that can really benefit from having the IT expert in the team longer than a few weeks. For many freelancers, the income is not the main reason for being self-employed, rather the flexibility that freelancing offers them. However, money matters, and 64% of all surveyed freelancers considered that they are getting better paid than permanent employees. Almost 80% (76,92%) of all surveyed freelancers want to continue working as a freelancer and almost the half of them (48,81%) said that they are planning to increase their hourly rate within the next year. As you can see, the German market looks promising for IT freelancers. If you are looking for IT jobs in Germany, freelancermap is your best ally. We have job opportunities in the fields of engineering, development, SAP, consulting and design. freelancermap has over 15.000 projects available worldwide - including English-speaking jobs in Germany! If you are interested in finding out more, you can download for free the full report (in German) here: Freelancer Kompass 2018.